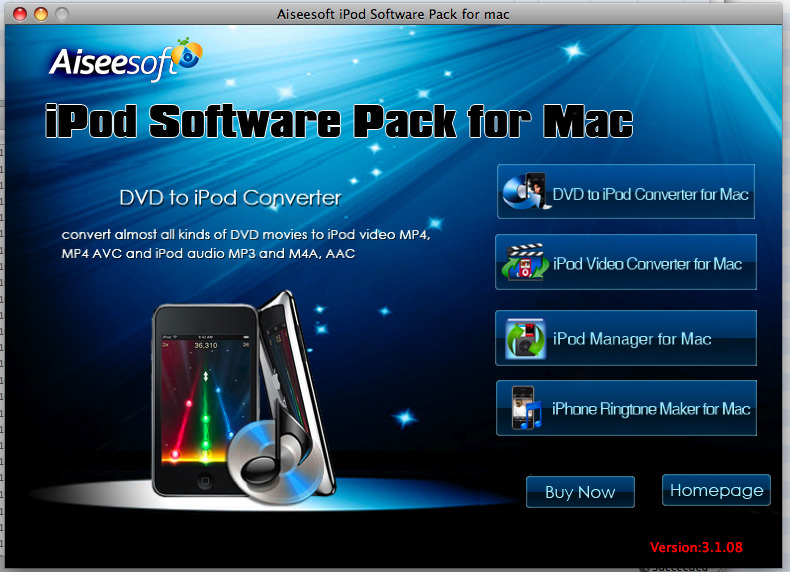 Aiseesoft iPod Software Pack for Mac is the pack of iPod Video Converter for Mac, DVD to iPod Converter for Mac, iPod Manager for Mac, and iPhone Ringtone Maker for Mac. It can rip DVD and convert any video/audio to iPod supporting formats, transfer audio/video files between Mac and iPod, even make iPhone ringtone from your video/audio sources. Moreover, it support iPod nano 6, iPod touch 4, iPhone 4, iTunes 10.1 and iOS 4.2 now after upgraded. Convert any DVD, video and audio to iPod, transfer files between iPod and Mac. ...... Moreover, this Mac iPod software Pack can support iPod nano 6, iPod touch 4, iPhone 4, iTunes 10.1 and iOS 4.2 now after upgarded. Rip all kinds of DVD movies to iPod video MP4, MP4 AVC and iPod audio MP3 and M4A, AAC with the latest MPEG-4 video encoding technology on Mac, along with convert DVD to iPod supporting formats. Backup iPod for Mac, import files or folder from Mac to iPod, with the help of iPod Manager for Mac. Assist you to make ringtone for your iPhone, iPhone (3G), iPhone 3GS, iPhone 4 from your own video and audio sources in any time length. Qweas is providing links to Aiseesoft iPod Software Pack for Mac 4.0.06 as a courtesy, and makes no representations regarding Aiseesoft iPod Software Pack for Mac or any other applications or any information related thereto. Any questions, complaints or claims regarding this application Aiseesoft iPod Software Pack for Mac 4.0.06 must be directed to the appropriate software vendor. You may click the publisher link of Aiseesoft iPod Software Pack for Mac on the top of this page to get more details about the vendor.